The 2018 Alpina Eve Heat 85 Women's Ski Boots are the perfect combination for a dreamy day on the slopes. They feature adjustable buckles, a volume control regulator at the rear of the boot that enables modification of the height and volume of the cuff, heat adjustable foam, InTemp heating electronic system, Thinsulate insulation and 4DRY material for water resistance and breathability. All these technologies result in comfortable ski boots with a good fit and great power transfer. 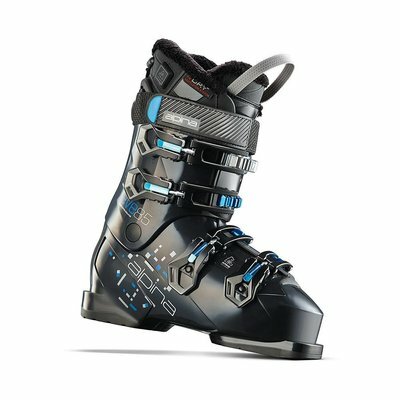 Get out and ski all season long in comfort regardless of how low the temps drop with the Alpina Eve Heat 85 Ski Boots! Volume Control Regulator: A special element at the rear of the boot enables modification of the height / volume of the cuff. Soft Entry System: Both the specially designed construction of the instep and the innovative Easy Entry system make boots simple to get on/off quickly and easily. 4Dry: 4DRY liners provide breathability, drainage, ventilation and water resistance, keeping the foot warm, dry and comfortable. InTemp Control System: Alpina’s Unique fully-integrated InTemp heating system keeps your feet comfortably warm at all times, but never overheated. boots you can adjust the boot volume for optimum fit.